Here's where you're going to find something very interesting connected with the Grandmaster. 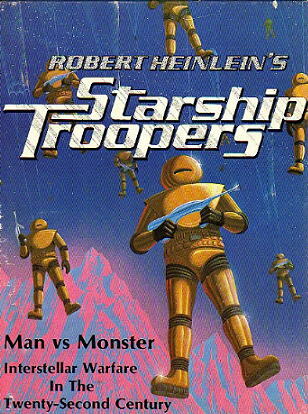 It's the Starship Troopers Game, dating back from 1976. This is not a book cover. 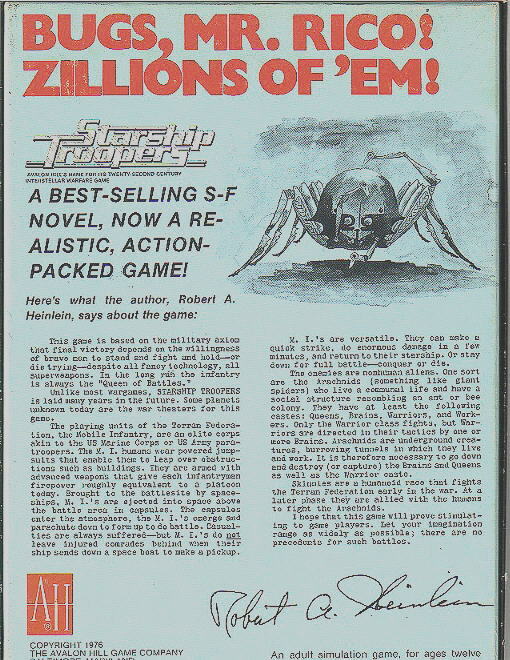 It's the Starship Troopers Game issued in 1976. Take a look at the back and read Robert A. Heinlein's liner notes. Simply enjoy! This game is based on the military axiom that final victory depends on the willingness of brave men to stand and fight and hold - or die trying - despite all fancy technology, all superweapons. In the long run the infantry is always the "Queen of Battles". Unlike most wargames, STARSHIP TROOPERS is laid many years in the future. Some planets unknown today are the war theaters for this game. The playing units of the Terran Federation, the Mobile Infantry, are an elite corps akin to the US Marine Corps or US Army paratroopers. The M. I. humans wear powered jumpsuits that enable them to leap over obstructions such as buildings. They are armed with advanced weapons that give each infantryman firepower roughly equivalent to a platoon today. Brought to the battlesite by spaceships, M. I. 's are ejected into space above the battle area in capsules. The capsules enter the atmosphere, the M. I. 's emerge and parachute down to form up to do battle. Casualties are always suffered --- but M. I. 's do not leave injured comrades behind when their ship sends down a space boat to make a pickup. M. I. 's are versatile. They can make a quick strike, do enormous danger in a few minutes, and return to their starship. Or stay down for full battle - conquer or die. The enemies are nonhuman aliens. One sort are the Arachnids (something like giant spiders) who live a communal life and have a social structure resembling an ant or bee colony. They have at least the following castes: Queens, Brains, Warriors, and Workers. Only the Warrior class fights, but Warriors are directed in their tactics by one or more Brains. Arachnids are underground creatures, burrowing tunnels in which they live and work. It is therefore necessary to go down and destroy (or capture) the Brains and Queens as well as the Warrior caste. Skinnies are a humanoid race that fights the Terran Federation early in the war. At a later phase they are allied with the humans to fight the Arachnids. I hope that this game will prove stimulating to game players. Let your imagination range as widely as possible; there are no precedents for such battles.